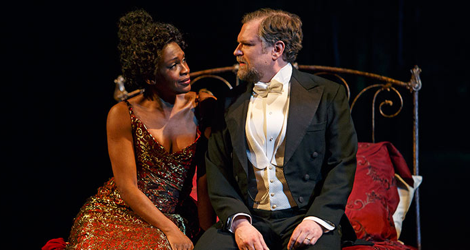 Stratford’s first-ever production of A Little Night Music is not altogether satisfying. The music itself, of course, is wonderful. Given that almost all the songs are written in 3/4 time this 1973 musical is really an homage to operetta. The score is sensitively played under conductor Franklin Brasz, but unevenness in the singing and acting and the grotesquely elaborate designs of Debra Hanson undermine the work’s effect. Inspired by the 1955 film by Ingmar Bergman, Smiles of a Summer Night, A Little Night Music focusses on three men and three women and their mismatched relationships in Sweden in the year 1900. The first couple we meet is the middle-aged lawyer Fredrik Egerman (Ben Carlson), who, after his first wife’s death, has married the 18-year-old Anne (Alexis Gordon). Now eleven months after the wedding they have still not consummated their marriage. Egerman’s son by his first wife, Henrik (Gabriel Antonacci), is studying to become a Lutheran minister, but he is deeply troubled because he has fallen in love with his step-mother. Unbeknownst to him, she secretly reciprocates his feelings. Frustrated with Anne, Egerman seeks the company of his former lover, the once famous actress Desirée Armfeldt (Yanna McIntosh), who is now reduced to touring the provinces. Desirée is already involved in a liaison with a married dragoon Count Carl-Magnus Malcolm (Juan Chioran). His wife Charlotte (Cynthia Dale) is an old schoolfriend of Anne. Charlotte tolerates the Count’s infidelity but she thinks Anne should know about Egerman’s, too. All the strands of the plot come together in Act 2 when everyone is invited (or simply turns up) at the country house of Desirée’s mother, Madame Armfeldt (Rosemary Dunsmore). Designer Debra Hanson, never known for restraint, has created sets that are obtrusive and costumes for the women that are garish at best. Act 1 takes place in the city and Hanson has decided to depict this with a series of five tall smokestacks each puffing out little white clouds of smoke. Since all the action in Act 1 takes place in private homes or in the theatre, all these upper-class characters somehow live and work in the industrial area of town which would hardly be the case. The set for the smokestacks also takes up almost half the available playing area of the Avon Theatre stage, thus unnecessarily forcing the action into the front half of the stage. For Act 2, Hanson signifies Madame Armfeldt’s country estate with an enormous, grotesque wrought iron gate with arboreal motifs on it to suggest a forest. Since, however, the gate is open throughout the action, most of the idea of the location comes from the projection of a forest behind it. Like the smokestacks, the gate also reduces the usable playing area on stage. Since there is little Hanson can do to expend her penchant for extravagance on the men’s tails and uniforms, she goes overboard in making the women’s gowns so elaborate that they look vulgar rather than refined. In Act 2 Hanson gives gowns to Anne, Charlotte and Desirée made of at least five different types of fabric, including velvets, satins, sheers and lamés, in as many colours. Given that the setting is in Sweden in 1900 where its strong Lutheran background frowned upon ostentation (and still does), the costumes are inappropriate for both the characters and the setting. When Desirée appears in a French farce in Act 1, Hanson shows a lack of research. A French farce in 1900 would refer to one of the works in the manner of Feydeau or Labiche, usually about marital infidelity and set in the present. Hanson, however, dresses the actors as if they were playing Molière not in 1900 but in the 17th century with lamé gowns and enormous wigs. Not only does she get the type of play and period wrong but she forgets that Desirée’s troupe is playing the provinces are would hardly have such luxurious costumes. We hear that Desirée’s character always wears a pearl necklace with one pearl for every lover, yet when Desirée appears Hanson has forgotten to give her any such necklace. Hanson’s design errors and overkill completely work against the charm and delicate irony that the musical is known for. Because of this, the performers have to work to create the appropriate atmosphere themselves, but the more effort that is needed to create charm, the less likely it will exist. As actors nearly all of the cast do well under the circumstances. Yanna McIntosh’s Desirée is a wonderful study of a woman who has grown tired of the “glamorous life” she has been living and now seeks something more substantial. The best part of the evening is the real rapport she and Ben Carlson’s Egerman achieve who both, even wordlessly, show that only their love for each other fends off despair and gives their lives meaning. Alexis Gordon is delightful as Anne, reflecting all the vivaciousness of youth that contrasts so strongly with the staidness of Egerman. As Madame Armfeldt Rosemary Dunsmore embodies the wry humour of someone who has seen and felt more than any of the younger generation will. Juan Chioran, who has played so many braggadocios before, is expert at conveying the egocentricity of Count Malcolm. Cynthia Dale is quite restrained as Countess Malcolm. She conveys more the woman’s cynical tolerance of her husband’s indiscretions rather than any strong desire to win him back. On the negative side Gabriel Antonacci would make the conflicted Henrik Egerman much more amusing if he were not so unrelentingly overemphatic. Newcomer Kimberly-Ann Truong plays Desirée’s daughter Fredrika Armfeldt, who is supposed to be only 13 years old. Yet Truong lends her so much maturity in posture and voice that she seems older than Egerman’s 18-year-old wife. Musically, kudos go to the group in the musical that Sondheim calls the Quintet. These are five singers whose songs introduce dramatic themes and comment on the action as a kind of chorus. All five – Sean Arbuckle, Barbara Fulton, Ayrin Mackie, Stephen Patterson and Jennifer Rider-Shaw – produce a classically trained sound and they sing well individually and blend beautifully as an ensemble. Among the actors playing the main characters, Alexis Gordon has the most operetta-like voice as full and rich as those of the Quintet. Gabriel Antonacci, Ben Carlson, Juan Chioran and Cynthia Dale are all strong singers in a less classical style and all have admirably clear diction, a necessary talent to get through Sondheim’s tricky lyrics. As the maid Petra, Sara Farb reveals a surprisingly strong voice and makes “The Miller’s Son” one of the highlights of the show. Two of the roles in the musical are written for actors who do not usually sing. As the the aged Madame Armfeldt, written for Hermione Gingold, Rosemary Dunsmore delivers the song concerning her many “Liaisons” in diseuse style rather as one might expect. The role of Desirée Armfeldt was written for Glynis Johns and the most famous song in the show, “Send in the Clowns”, was written for her. Over time, however, the song has become a standard recorded by so many famous singers that now it comes as an unwelcome surprise to find it given to a non-singer. Yanna McIntosh manages to get through it without embarrassing herself but does not have the confidence or mastery to do any more than that, much less provide an interpretation of the song. To help her, conductor Franklin Brasz has sped up the tempo, but that, of course, diminishes the wistfulness so many people associate with the music. Of Canadian productions of A Little Night Music, my favourite still remains the Canadian Stage production of 1996 directed by Michael Shamata that got the mood exactly right. Next would be the Shaw Festival production in 2008 that had the great advantage of being performed in the intimate 327-seat Court House Theatre so that the singers did not need amplification and made us feel as if we were overhearing their thoughts. The current Stratford production where the singers have to struggle to convey intimacy in the face of Hanson’s overbearing designs, sets up a conflict of intentions between the designer and the work that ruins its mood. It is bold for Stratford to present the piece but really it would be more effective with the singers simply in evening dress on a bare stage than it is now. Photos: (from top) Yanna McIntosh and Ben Carlson; Cynthia Dale, Juan Chioran and Alexis Gordon with member of the company; Ben Carlson (in background) Cynthia Dale and Juan Chioran. ©2016 David Hou.